Java 9 Platform Module System introduces the concept of modules that allow breaking up a project into logical parts. Modules provide better configuration and greater encapsulation. A module consists of classes and interfaces and a configuration file known as module-info.java. Module A can access only those members of Module B that have been exported by Module B. To specify that Module A needs Module B, we use the ‘requires’ keyword in the Module A configuration file. To specify all packages exported by a module we use the “exports” keyword in module-info.java file. 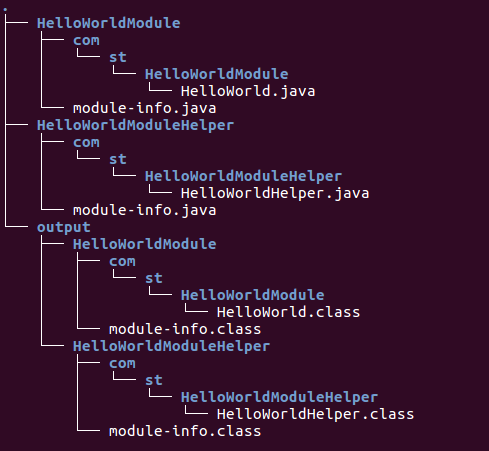 Lets look at an example of the module system using a ‘Hello World’ Example. We write a class that prints Hello World followed by the name of a person. In line 2 we compile the HelloWorldHelper class and put the class files in output/HelloWorldModuleHelper directory. In line 4 we compile the HelloWorld class and put the HelloWorldHelper class in the classpath. We run the HelloWorld class and put the Helper in classpath and all works well. Its time now to introduce modules. We want to create two modules, one for the HelloWorld class and other for the HelloWorldHelper class. In line 3 we compile the module-info.java class, just like any other java class. In line 6 we include the module path in javac using –module-path. The platform module system is a fundamental change to the Java language specification. In the next tutorial we will look at the JShell tool which is a very handy tool for rapid development and prototyping.